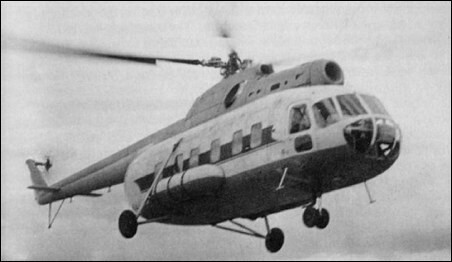 Mi-8 prototype incorporating Mi-4 main rotor and transmission and one 2700shp Soloviev AI-24V turbine mounted on top of fuselage. First flown on 24 June 1961. Subsequently fitted with 5-blade rotor and two 1400shp Isotov TV2-117 engines. obvious front liner air liner no imitations available originals only or?